The English Riviera, otherwise known as South Devon´s Bay, stretches 35km long and includes the 3 beautiful seaside towns of Torquay, Brixham and Paignton. This part of England is particularly popular amongst our mature language students. The area is known for its spectacular beaches, picturesque villages, beautiful coastal walks, warm weather and stunning scenery, to name just a few of the attractions. 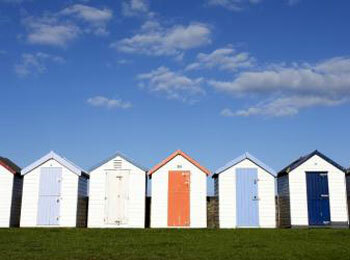 Enjoy long strolls along the promenade and pier and absorb the wonderful views across the bay. There is an international marina in Torquay, with a selection of harbour-side seafood restaurants, where you can wine and dine to your heart´s content! The 'Elephant Restaurant' offers award-winning cuisine by UK celebrity chef Simon Hulstone. Many of the bars and restaurants serve the Catch of the Day, which could be Salmon, Trout, Mackerel or the famous Devonshire crab! Otherwise you can also, of course, find a portion of traditional, mouth-watering, English Fish 'n' chips! Torquay is also a haven for our visitors who love to shop! From your everyday items and groceries, to small local gifts, to luxury beauty products and plenty of designer brands along The Strand, it can all be found here! For a selection of independent stores selling handicrafts and vintage jewellery, then head for the top of Union Street and the Market Forum. You can also shop until you drop in Union Square and the under-cover Fleet Walk. In addition to the beautiful beaches, scenic walks, delicious cuisine and wonderful shopping opportunities, Torquay has a long list of cultural events and year round attractions catering for all interests. Annual favourites to watch include maritime events and regular regattas, in addition to markets, live music shows and Red Arrow displays! The events programme of the English Riviera does not calm down during the wintertime, so this really is an ideal year round destination! The school building is situated just a five minute stroll from the centre of the town. There is a spacious garden and a sun terrace with BBQ facilities. The school offers modern facilities such as whiteboards, audio-visual equipment and a student lounge with plasma TV. 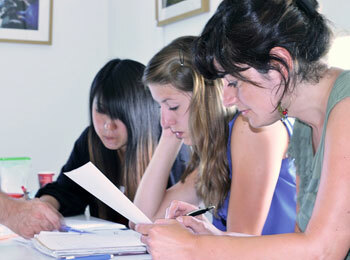 You can also take advantage of the well-equipped resources centre, bookshop and study room. The school has its own cafe where you can purchase light lunches, as well as hot and cold drinks. Against a wonderful backdrop, with views over beautiful coastal scenery, our Club 50+ English Language course in Torquay welcomes many mature students year after year. This 2 week language programme for older students takes place on specific start dates throughout the year. Students receive 15 hours of English language lessons each week, in groups of just 10 students maximum. The minimum age is 50 years old and students must have at least an elementary (A2) level of English in order to attend this programme. This is a specially designed course for all mature students, which includes a full cultural activities programme in the afternoons and evenings and full day excursions at the weekends. Arrival transfer to your accommodation, from Torquay train or bus station. 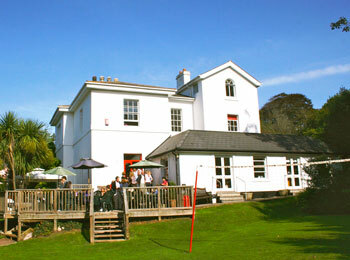 Accommodation at our school in Torquay is available in the school’s own residence building, or with a British host family. For a true insight into everyday life in a traditional English town, we recommend you to book accommodation with a host family. This is also the best way to experience the English language and to have the opportunity to practise your skills whenever you wish. Staying with a host family in Torquay also enables you to meet the local people, to try the local food and get to know the inside scoop about the town and surrounding countryside! 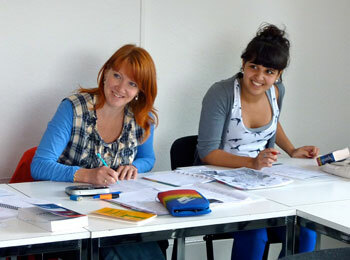 The school works with experienced hosts, many who have accommodated students for over 10 years. All host families are chosen carefully and inspected often. Their homes are clean and comfortable with a good standard of living. Our school guarantees to have no more than one student of any native language staying with a host at one time, meaning that you do not have to worry about the temptation to use your mother tongue! Shared rooms can, however, be booked on request if you are travelling together with a partner or with a friend. We offer standard host family accommodation with a private bedroom and a shared bathroom. Alternatively you can select the Host Family Plus option for a private room, with private bathroom facilities. 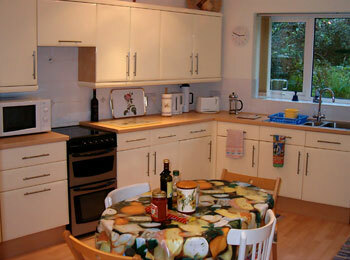 Breakfast and the evening meal with your host is included, in addition to lunch at the weekends. If you would prefer more privacy during your stay, or the opportunity to meet many other visitors to the town, then the school’s own residence building is the ideal choice of accommodation. The residence is situated directly opposite the school, also just 5 minutes walk from the town centre. All of the rooms are en-suite and some also offer views of the sea. There is wireless internet connection and a radio and television in every room. Enjoy a buffet breakfast and a cafe serving hot and cold lunches during the high-season summer period. Students may also prepare their own light meals or snacks in the residence kitchen. For relaxing or for studying you can make use of the study room, common area, sunny terrace or the residence garden. 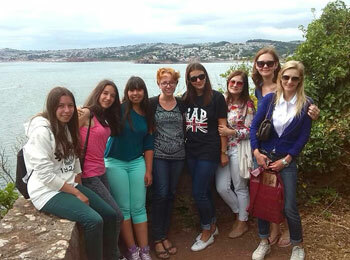 All students will be met at the train station, or at the bus station, on arrival in Torquay. Please therefore ensure that you inform us of your full arrival details at the time of booking. 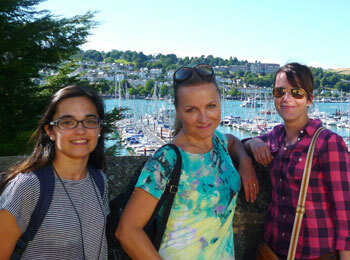 Torquay offers a relaxed atmosphere in which to combine a perfect holiday with an English language programme. The town is a wonderful example of a traditional English seaside resort, with two theaters, great pubs hosting live music, a buzzing harbour, plenty of cocktail bars and a casino. Torquay is host to numerous events and festivals throughout the year. For those who prefer less action, there are spa treatments and saunas, boat trips around the Bay or kilometres of stunning seaside footpaths to wander along. This part of England is infact a walker’s paradise, with a unique coastline ideal for exploring. Activities for our Club 50+ students specifically include Jazz nights, Film club events and special interest talks on various topics. There are guided visits to the Torquay Museum and trips to the National Park. You can enjoy Fish & Chips nights or a historical trip to the cathedral city of Exeter, with a traditional English cream tea! Combine a relaxing holiday by the sea, with a high quality English language programme on the English Riviera and take advantage of all that this beautiful Bay has to offer! The Club 50+ progamme in Torquay caters for all students aged 50 or above who have some prior knowledge of English (minium level A2 - elementary). Our school specializes in courses for mature students and offers an exceptional high quality of teaching, in small groups, to maximize your learning. You can arrive in Torquay by rail or by bus from all major UK airports. If you are travelling from Europe you can also arrive via Eurostar or by ferry. Easy airports to use include Exeter, Bristol, Heathrow and Gatwick. Trains leave from Paddington train station in London and the journey takes approximately 3 hours. Let us know where you are travelling from and we will be happy to help and advise you with regards to the best travel possibilities. 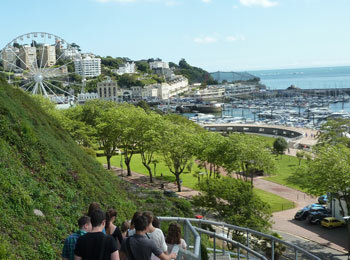 All students arriving in Torquay are met at the train or bus station and taken directly to their accommodation. This transfer is included in the fees.